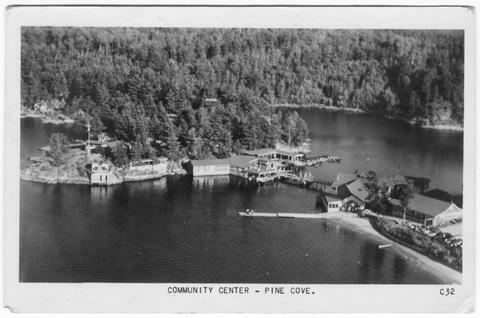 Item 033 - Community Center - Pine Cove. C32. Card was cancelled at Noelville, Ontario, 31 July 1951. Card is addressed to: Miss Sue & Joyce Hanna. Inwood Road. R#7. Pittsburgh. Pa. U.S.A. Message reads: Pine Cove. Mon. Eve. Dear Hannas: We arrived safely and caught about 40 nice fish today. I caught about 9. Weather has been grand. Love, Uncle Hobo.